“He is back to where he was at with me,” says the Celtic boss. BRENDAN RODGERS INSISTS he never fell out with Raheem Sterling when the pair were at Liverpool. After several seasons together at Anfield, Sterling was the first to leave, making a move to Manchester City in July 2015. Just months later, Rodgers was sacked – ending a spell of just over three years at the helm. A contract dispute before his £44 million move to City reportedly damaged Sterling’s relationship with Rodgers, something the Northern Irishman denies. “I never had issues with Raheem,” Celtic manager Rodgers told the Daily Mail. “Yes, there was that moment where we made a point to him early on, but that was it really. He had a personality but he could accept that and hopefully if you speak to him he would say we had a really close relationship. “A lot of things that were being said when he left were naughty really. The duo are set to meet when Celtic host City in the Champions League on Wednesday. Sterling has been in spectacular form for Pep Guardiola’s City, scoring four Premier League goals to go with two assists in six outings. “He is back to where he was at with me,” Rodgers said. “I am not saying that in any other way than his level. He’s drifted for the last wee bit of time since he left Liverpool. Email “Brendan Rodgers hails Raheem Sterling's return to form, insists he never fell out with City star”. 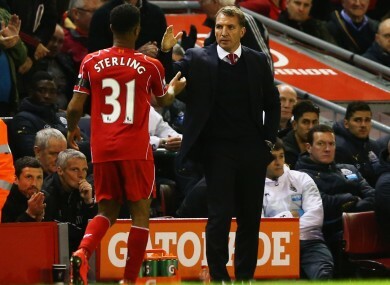 Feedback on “Brendan Rodgers hails Raheem Sterling's return to form, insists he never fell out with City star”.